Scorched earth in Marinduque, Philippines. Someone Else’s Treasure examines the social and environmental impacts of different multinational projects from the perspectives of various affected indigenous communities. The companies’ perspectives are easily accessible. The views of NGOs, human rights organizations and environmentalists are easily accessible. The perspectives of economists, lawyers and academics are easily accessible. The views of politicians, geologists and engineers are also easily accessible. But the perspectives of the people who actually live next to these mines are not. For this reason, the focus of Someone Else’s Treasure is on the people, not the companies. Someone Else’s Treasure is not about a handful of companies that are breaking the law because, in fact, there are no international laws that require these companies to respect human rights and environmental standards. Someone Else’s Treasure includes the stories of affected communities in Australia, Canada, Chile, Guatemala, Papua New Guinea, the Philippines, and Tanzania. These intimate portraits are both a critique of the myth of progress and a celebration of the spirit of resistance. In an effort to better understand the true cost of an industry that shapes the world around all of us, the focus is on the externalized – the men, women, and children, that have been left out of the equations and are therefore forced to pay the price for someone else’s treasure. THE PRICE OF GOLD - An artisanal miner in Tanzania holds out some gold nuggets. The price of gold has been skyrocketing, reaching record high prices in recent years. Multinational mining companies search the ends of the earth for these, and other, valued natural resources. Meanwhile, the people who just happen to live there are the ones who usually end up paying the price. For minerals that mean little to them, for profits they never see, the price they pay includes the very things that they treasure most – including the loss of traditional lands, livelihoods, health, culture, and loved ones. UNCLE CHAPPY - Chappy is an aboriginal elder of the Wiradjuri Nation, the traditional owners of the Lake Cowal area in Australia. For over six years the Wiradjuri have been taking legal action against the world’s biggest gold mining corporation, which operates an open-pit gold mine at Lake Cowal, the “sacred heartland of the Wiradjuri Nation.” As a result of the desecration of their sacred lands, Chappy explains, “our cultural heritage and the very essence of our cultural being is at stake.” An estimated 50% of gold comes from indigenous lands. Their lands tend to be vulnerable to encroachment because of their peoples’ lack of power within their country’s political systems. In this picture, Chappy pauses for a moment as he passes by the window of a jewelry store. Approximately 80% of newly mined gold is used for jewelry. MWITA - The Mwita family lives in Nyamongo next to the North Mara Gold Mine in Tanzania. The waste rock on the edge of the mining pit can be seen just behind their huts in this picture. 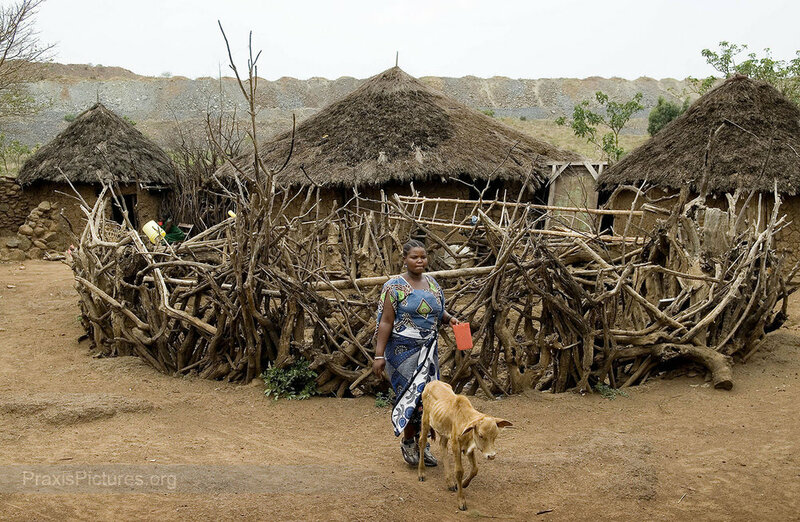 The family used to live quite comfortably, by Tanzanian standards, by farming and raising livestock, “but now there are no pastures because the mine has almost taken the whole land,” they say, “we have no sources of income and we are living only through God’s wishes.” Their surviving livestock are visibly malnourished. They say they would like to be relocated, but the application process has been complicated, and they feel the amount of compensation they have been offered is insulting. TRIXIE - Standing a few meters away from her home in Benguet province, Philippines, Trixie looks down at the tailings dam of the Victoria Gold Mine where the toxic waste from the mining process is dumped at a rate ranging between 1,500 and 2,500 metric tons per day. This is the third dam built here after the previous two collapsed. This particular dam has been completely inadequate against the torrential downpour during the yearly rainy season and is especially vulnerable to earthquakes as Benguet is directly above a fault line. For years the chemicals have been leaking out into the nearby river systems. CONTAMINATED WATER - Just a few meters past the Victoria Gold Mine’s tailings dam, contaminated water (left) – carrying with it cyanide, lead, copper, and mercury – joins together with the clean water (right) coming from the mountain springs into the river system. Many mine sites are located in the mountains that act as watersheds for the surrounding river systems, which poses serious threats to those living downstream from the mines. REMY - Remy washes her laundry in the poisoned Mogpog River in the Phillippine island of Marinduque. In 1993 one of the tailings dams of the Marcopper Mine burst sending tons of mine waste raging down the river in a flash flood sweeping away homes, people and livestock. Three years later a second collapse sent waste in the opposite direction destroying the Boac river. To this day both of the islands main rivers remain biologically dead and contain dangerous levels of toxic chemicals. Dead trees and other debris can still be seen all along the rivers. But people here have no other water sources to rely on. FOOD SECURITY - In Oriental Mindoro, Philippines, Henry (second left) and his family enjoy a meal consisting of rice, fish and vegetables. The province of Oriental Mindoro is ranked third as the province that produces the most food in the Philippines, and is known as the ‘food basket’ of the region. The food security of Mindoro is under threat, however, by the proposed Mindoro Nickel Project. The proposed mine site is located up in the mountains within a critical watershed area that provides the irrigation for 70% of the province’s vital rice fields and fruit plantations. MABIBHI - Mabibhi is a resident of Nyakabale, Tanzania, a small farming community near the Geita Gold mine. He suffers from severe skin problems that first started appearing about three years ago. Residents of Nyakabale have compiled a list of 36 unusual deaths since the mine began operations in 2000, which they link to the chemicals from the mine. “The first unusual deaths,” according to one resident, “occurred shortly after the Geita mine began operating … a family of four died after eating a dying rabbit they had caught near the tailings dam. Since then, a number of women have had miscarriages.” Mabibhi is 75 years old and has lived a full life, so he says that it does not matter what happens to him — what he is really worried about is the future of his grandchildren. MARIA - Since the Marlin Mine moved in next-door, internal divisions, violent killings, and kidnappings have terrorized the once peaceful community of San Miguel Ixtahuacan, Guatemala. The divisions have torn families apart between those that are for and against the mine. The emotional toll weighs heavily on everyone’s shoulders. “They are making us suffer, we are not being treated as human beings,” says Maria, referring to how the company has turned community members on one another. Maria lives in an area where she is surrounded by mine workers. Intimidation and threats of violence against anyone speaking out against the mine have taken an emotional toll on Maria. But she refuses to back down and remain silent. ALBERT - Albert has worked as a miner in Benguet, Philippines, for fifteen years trying to support his family of ten. But his wages are not enough to support all of them, so his wife has had to leave for the city with their four oldest children to sell fruit in the market. Many of the men risking their lives underground say they feel exploited as they struggle to provide for their families while the company profits in the millions. But Albert has no doubt that it’s a sacrifice he is willing to make. “My family,” he says, “are my inspiration.” Together with his wife, they are putting their children through school in the hope that they will have better lives. It is this hope that gets him out of bed every morning to go back underground. LILIA - Lilia’s husband, Peter, had worked at the Victoria Gold Mine for seventeen years when all the workers went on strike in 2005. The workers were on strike for three months demanding better wages, benefits and job security to reflect the dangers of their jobs. Management refused to meet their demands and responded by firing the 19 union leaders behind the strike, including Peter. With Peter unable to find work, the burden of supporting the family now falls on the shoulders of his wife Lilia, sitting here with their youngest daughter Trixie. Lilia has no formal education so her prospects are limited. The only real option available to her is to work abroad as one of the millions of Filipino domestic servants employed all over the world. What troubles Lilia most is the thought of being separated from her family. BALDO FAMILY - The Baldo family lives in the village of Kisluyan, on the Philippine island of Mindoro. Kisluyan is one of 26 indigenous villages that face the threat of displacement, to make way for the proposed Mindoro Nickel Project. Although many of the indigenous peoples in the neighboring villages are deeply opposed to the mine, it has proven difficult to organize the groups to show their unified opposition and stand up for their rights. Traditionally, the Alangan have always been a shy and peaceful people averse to confrontation. The company has taken advantage by forming their own group to pose as representatives of the affected indigenous communities to sign documents consenting to having the mining project on their ancestral lands. MAXIMO - Maximo is the oldest member of Kisluyan, on the Philippine island of Mindoro, and the acknowledged leader of the community. Maximo’s biggest worry is for the future generations. Living in relative isolation high in the mountains, the Mangyans have done well to hold on to their cultural identity despite increasing external interference. For the Mangyan, their land is the very foundation of their identity. Generation after generation, the Mangyans have been taught to care for their land; “we take care of the land, and the land will take care of us,” says Maximo. Many of them worry that disaster will befall them if their lands – especially their ancestral burial grounds – are desecrated. SHEILA - Sheila is one of 258 men, women, and children, from Mtakuja village who were displaced in late July 2007 to make way for an expansion of the Geita Gold Mine in Tanzania. The displaced villagers of Mtakuja say that the police forced them from their homes at gunpoint in the middle of the night and dumped them in a small one-room abandoned building. “We were moved here like people in a war-torn country, and now we are all tucked into a small place like prisoners who have committed the worst of crimes” laments Abdallah, a former village executive officer. Thousands of people are reported to have been displaced by multinational mining companies in Tanzania. BURIED ALIVE - During the evictions of thousands of people to make way for the Bulyanhulu Gold Mine in Tanzania, fifty-two artisanal miners were allegedly buried alive in their pits by company bulldozers. The issue has developed into a bitter international dispute involving local communities, international NGOs, the governments of Tanzania, Canada, and the World Bank. The company denies the allegations and maintains that “the way people left this site was in a peaceful, systematic fashion”, reports in the Tanzanian press at the time reported mass confusion, looting, robbery and bloodshed as people fled from police in riot gear. According to company documents, there may have been as many as 400,000 people living in the area before the evictions. Numerous witnesses have testified in sworn statements that people were being beaten up by the police and were ignored when they told officers that there were still people inside some of the mineshafts as the bulldozers were filling in the pits. DEOGRATIOS - Deogratios is the traditional witchdoctor, or medicine man, of the indigenous community. He was among the thousands of people who were evicted to make way for the Bulynhulu Gold Mine in Tanzania. He remembers being forced from his home by heavily armed paramilitary forces only one day after the Minister of Minerals and Energy had issued an order giving the Bulyanhulu residents one month to vacate the area. Deogratios and his family had nowhere to go, so for two months after being forced from their home they were living in the bush. During this time his wife became ill. But with their home destroyed, and without access to his medicines, the healer could do nothing as he sat and watched his wife die. JETHRO - Jethro is an indigenous Ipili from Porgera, Papua New Guinea, pictured here on his journey to Canada. Jethro left his home and traveled halfway around the world to speak out at the shareholders meeting of the company that is operating the Porgera gold mine. Speaking as a representative of the residents of Porgera, the traditional landowners, Jethro accuses the company of “ignoring the impacts of its projects and resorting to goon squads when people rebel against it. This outrages the conscience of local Indigenous communities, especially when the mine is right next to our homes.” Seeing the overwhelming material wealth of North American cities, Jethro understands that the development that had been promised, was never really intended for them. SOMEONE ELSE'S TREASURE - As the sun sets over the mountains of Benguet province, in the Philippines, Lilia and Trixie walk along the Victoria Gold Mine’s airport runway near their home where all the gold is flown out of the province. The pattern has been repeated many times around the world; the companies come in promising to bring with them jobs, development and prosperity. In reality, the people who live there are not the ones benefiting from the wealth beneath their feet. For them, the social and environmental impacts will be felt for generations. Families are being torn apart, Indigenous cultures threatened, entire populations displaced, livelihoods lost, and ecosystems destroyed — all for someone else’s treasure.